Create one of a kind samplers, quotes and monograms with these free Cross Stitch and Back Stitch Alphabet patterns from around the internet. From traditional to whimsical, there are patterns for every type of person and decor. As always, when you use patterns that are for free, please be respectful of the original creators copyright rules. Let's check out the awesome ABC selection below. Stitch the Alphabet Block Sampler as designed or use the letters to chart a saying. The letters are back stitch. 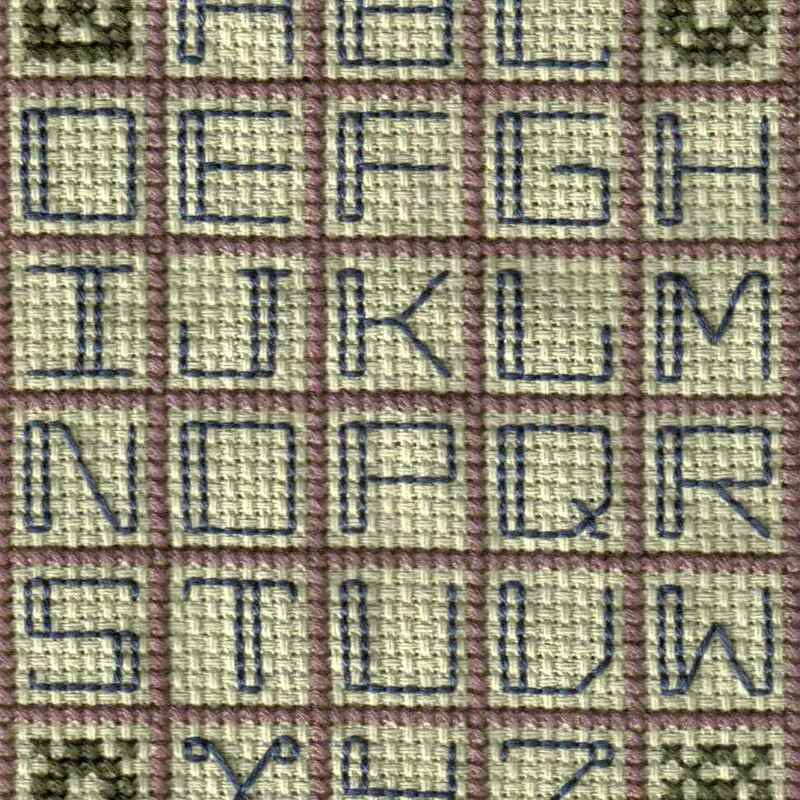 This is perfect for a monogram or for a sampler by linking all the letters together. You can use whatever color you like depending on the decor of your house or style. Use the free Baby Bottle Alphabet pattern to personalize a baby bib, diaper bag, or burp cloth. Create a birth sampler using this pattern for a beautiful heirloom. This alphabet is thirteen stitches tall and can be stitched as a sampler as charted, or in a different configuration if you like. This alphabet is very simple. It is perfect for teaching beginners how to cross stitch. This alphabet is used for personalizing the free Do Not Weep Collection. It would also work as a alphabet sampler or for charting other sayings. Large Cross Stitch letters for stitching as a sampler or using to chart a saying. This pattern coordinates with this free Uppercase Alphabet Pattern. Upper and lowercase letters for charting sayings or creating samplers. Includes numerals. The alphabet from the Heart Border Sampler could be used for other projects and sayings. A tiny alphabet to use with small projects. Add a saying or a signature using it. The letters are part of a sampler, but could easily be used as part of another project. Use this alphabet to create your signature for your project or for stitching a saying. Diamond-shaped Alphabet patterns to use for monogramming linens or other items. This pattern was designed for adding personalization to the 2008 ornament Collection, but it could be used for other projects as well. Cross Stitch alphabet for using in samplers or sayings. Only the letter Q uses any back stitch. This alphabet coordinates with this lowercase alphabet pattern. Use this alphabet to personalize the free Traffic Sign pattern or use it for other projects or sayings. This alphabet pattern coordinates with the Thanksgiving Pumpkin Motifs and Saying Collection. Use it to stitch a Thankful saying or for other projects. This alphabet was designed to use with the free Tiny Angel pattern but you could use it for other projects if you like. A small alphabet to use for sayings or signatures. If you use one of the free patterns at About.com Cross Stitch in a project, please be sure to submit a photo of it for the About.com Cross Stitch Photo Albums.